Each year on February 22, Girl Scouts and Girl Guides from around the world gather to celebrate World Thinking Day. Thinking Day was created in 1926 as an annual time for Girl Scouts and Girl Guides to "think" of each other and give thanks and appreciation to their "sister" Girl Scouts. February 22 was chosen because it was the mutual birthday of Lord Baden-Powell, and his wife, Olave, who served as World Chief Guide. Since it's start in 1926, each year, Girl Scouts and Girl Guides have celebrated World Thinking Day by: learning about their sister scouts, participating in advocacy themed activities, fundraising for the World Thinking Day Fund, and earning their World Thinking Day badge. This year's theme for World Thinking Day is, "together we can save children's lives." While celebrating the international sisterhood of Girl Scouts, girls are encourages to make a difference in their world by participating in a service project focused on reducing child morality rates around the globe. For more information on earning the World Thinking Day badge or participating in activities in your community, click here. 2012 marked the Year of the Girl and what a year it was! As we look forward to 2013 and the start of the next century of Girl Scouting, we'd like to take a moment to reflect of our accomplishments and celebrations from 2012 - all made possible by our amazing volunteers, donors, and of course our girls. Girl Scouts had one of the most successful cookie sales ever! The 2012 cookie sale provided more than 10,000 girls with life skills and leadership opportunities. And thanks to special donations from Station Casinos and Sam's Town, Girl Scouts' after-school program were expanded providing services to more than 1,000 girls throughout southern Nevada. 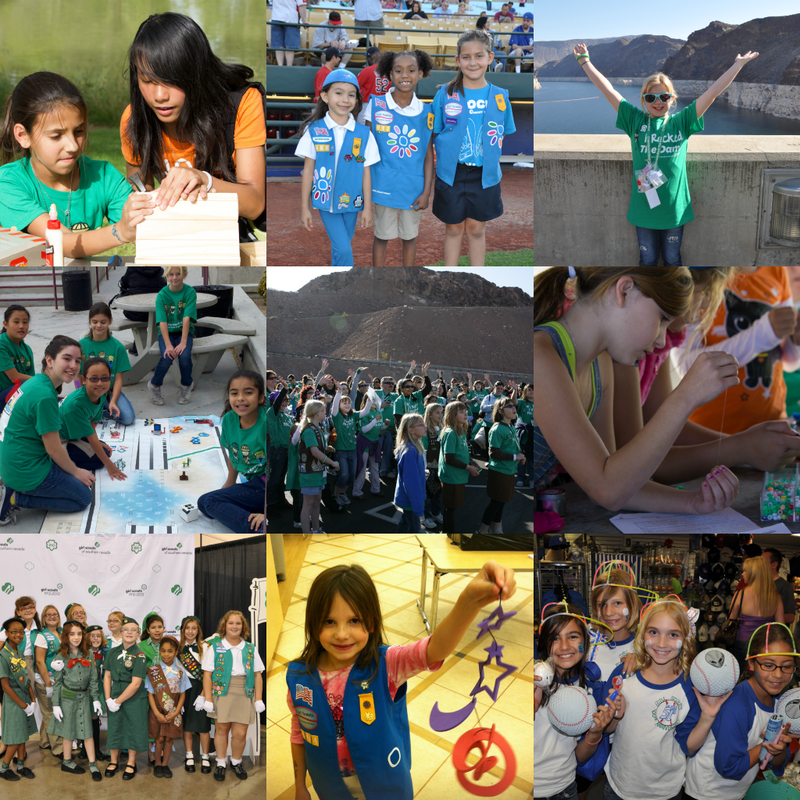 We Rocked the Dam with more than 1,000 Girl Scouts participating in a bridging ceremony across Hoover Dam. The Las Vegas 51s honored our birthday with a whole game dedicated to Girl Scouts - including Girl Scout inspired jerseys and fireworks. We celebrated a World of Girls with more than 3,000 individuals attending our 100th birthday bash/expo Cashman Center. And as we celebrated all of the amazing accomplishments of the first 100 years of Girl Scouts, our girls continue to amaze us with more! Our girls traveled the world; gave service to those in need; and honed their leadership skills in important areas such as STEM, financial literacy, environmental issues, and healthy living. Our girls are truly changing the world. Join us in making 2013 just as special. Summer is here and Girl Scouts’ Camp Foxtail is filled with the laughter of hundreds of girls. Many of us share fond childhood memories of summer camp – making new friends, sleeping in bunk beds, day hikes, campfires, and my favorite… s’mores. I recently met an inspirational young lady who has a special connection to Camp Foxtail. Zoey attended her first camp session two years ago at age 8. While at Camp Foxtail, Zoey discovered a love of archery. Two camp seasons later, Zoey is taking private lessons and honing her archery skills in hopes of one day making it to the Olympics. Just think - the tradition of summer fun at camp sparked the hopes and dreams of a future Olympian. One day we’ll all say, “We knew Zoey when she was a Girl Scout at Camp Foxtail”. Summer camp is a place where girls like Zoey can express themselves, discover their own abilities, and enjoy the summer fun of being a kid! 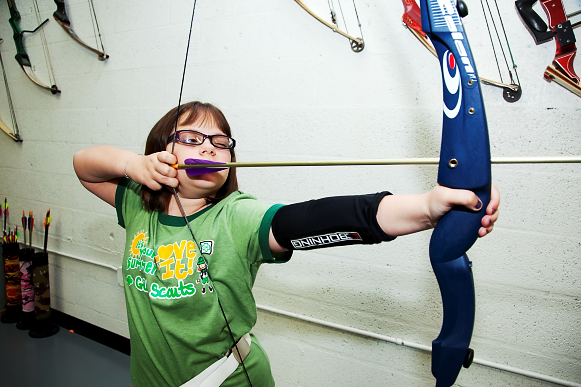 Later this month, Zoey will be back at Camp Foxtail having fun with her friends and honing her archery skills. But for many girls and their families, summer camp is still beyond their financial reach. This year we received requests for financial aid from more than 75 girls in Southern Nevada who, by no fault of their own, simply cannot afford to attend camp. I’m hopeful you will join me in making a gift to camp by using the enclosed donation card or visiting us online at girlscoutsnv.org. Together we can Send Her to Camp! Click here to read more about Zoey in a story on the Las Vegas Review Journal website. Trunk or Treat at La Bonita Supermarket on Las Vegas Blvd in North Las Vegas! Tell us - What is your favorite cookie? Created by Charlene Domschot Jan 7, 2011 at 2:43am. Last updated by Charlene Domschot Jan 7, 2011. Created by Charlene Domschot Jan 7, 2011 at 2:41am. Last updated by Girl Scouts of Southern Nevada Jan 7, 2011. Hagerty Driving Experience (ages 15-25 with valid driver's license or permit) LEARN TO DRIVE A MANUAL TRANSMISSION! On Saturday, September 21, Hagerty Insurance will be hosting the Hagerty Driving Experience Powered by Ford program at Las Vegas Motor Speedway to help teach young drivers how to drive a manual transmission using exciting classic cars. The Drug Enforcement Administration (DEA) created a Red Ribbon Week patch to encourage and support Scouts who wish to learn about Red Ribbon and participate in local efforts to educate youth about the dangers of drug abuse.